Settled in the late 1730s, Greenwich was a small rural town in western Massachusetts. In January 1786 the people of Greenwich submitted the following petition to the Massachusetts government. 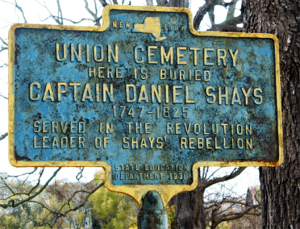 It contains several of the grievances that contributed to Shays’ Rebellion later that year, including debt, currency fluctuations, high taxes, mortgage foreclosures and bankruptcies. 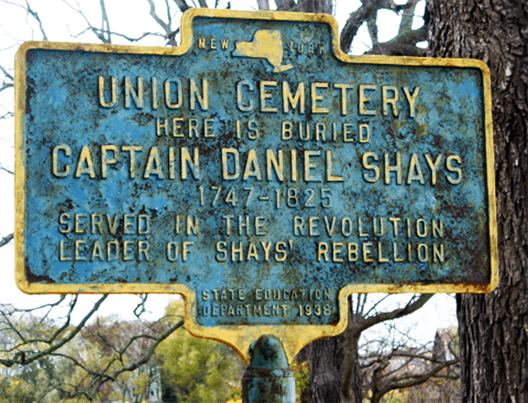 The unrest of Shays’ Rebellion contributed to political agitation against the Articles of Confederation and, eventually, the adoption of the United States Constitution. That in the time of the late war, being desirous to defend, secure and promote the rights and liberties of the people, we spared no pains but freely granted all and assistance of every kind that our civil fathers required of us. We are sensible also that a great debt is brought upon us by the war, and are as willing to pay our shares towards it as we are to enjoy our shares in independence and constitutional privileges… And we believe that if prudent measures were taken, and a moderate quantity of medium [hard currency] to circulate so that our property might sell for the real value, we might in proper time pay [the] said debt. Suits at law are very numerous and the attorneys, in our opinion, very extravagant and oppressive in their demands. And when we compute the taxes laid upon us the five preceding years (the state, county, town and class taxes) the amount is equal to what our farms will rent for. Sirs, in this situation what have we to live on? No many to be had, our estates daily posted and sold, as above described. What can Your Honours ask of us unless a paper currency or some other medium be provided so that we may pay our taxes and debts?